My kids' cross country banquet was this weekend and I needed to make something fast. I came up with roasted vegetable enchiladas. On left is the mixture of black beans, chopped onions, green chilies, yellow squash, zucchini, tomatoes, and sweet corn. I sauteed the onions, squashes, jalapenos, and corn, then when done (vegetable are soft but not mushy), mixed with the other ingredients in a bowl. I also added 3T of chili powder, 1T of garlic powder and 1T of cumin. Place store-bought corn tortillas in the bottom of a baking dish, then pour one can of canned green chile sauce over the tortillas. Layer the vegetable mix over the tortillas, then add another layer of tortillas and shredded Monterrey Jack cheese, then another layer of vegetables. Top with one more layer of tortillas, cheese and pour a can of chile sauce over the whole thing. Cover with foil and bake in oven at 350 for 15 minutes, then uncover and cook another 10 minutes. Take out and let set for ten minutes before cutting. A few days have gone by since the end of the Mini Diet Challenge. How did it go? 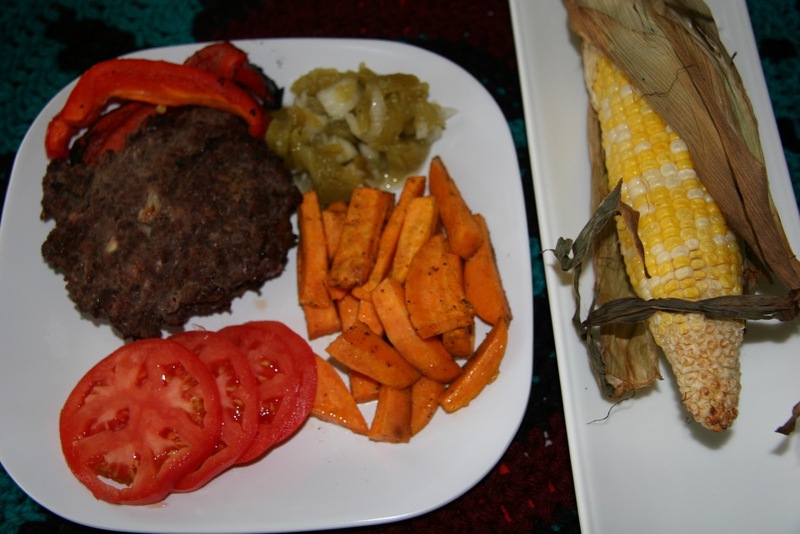 First, even though I normally consume a great many indigenous foods (corn, tomatoes, peppers, potatoes, bananas and squash almost every day), it did require effort to make certain New World foods were available in the house for meals. As much as I like those foods, I felt like my list of foods to chose from was rather short. Second, it took some real planning on workdays. I couldn't just drop in any restaurant or campus quick cafe and buy some soup, bread or crackers. No sandwiches or wraps. Chinese and Italian food was out, as well as pizza, sushi, and Mexican food that contains cilantro, wheat tortillas, beef, pork and chicken. I made baggies of dried fruit, nuts and seeds, but that mix is high in calories and not particularly filling. Eating a big hunk of turkey from my lunch box was satisfying, but I got tired of that. Water did not satisfy me, either. Third, this is not a convenient diet. One has to cook a lot of it, unless you like raw vegetables. Sometimes I do, but not all the time. Fourth, I did feel "lighter" and did not have stomach aches. I am not lactose or gluten intolerant; but, I am sensitive to milk products and especially breads. If you have stomach or intestinal pains, dietitians will tell you to keep a diet log to try and pin-point what it is that is annoying your guts. Now I know for sure. Fifth, a few people questioned the purpose of the diet. If there are so many healthy choices to chose from today, why limit my diet to only New World foods? Good question. The purpose of this diet was to show support for Marty and his group. I'm not sure I could do this for an entire year, so I can now certainly empathize with them. Another goal was to educate ourselves about what our ancestors ate. We can read about the foods in a book, of course, but actually eating the same things (or, as close to the historic foods as we can get) shows how difficult it can be to not only find the food items, but also to combine them in ways our body can best use them. 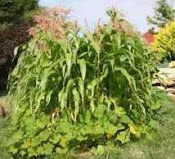 For example, eating only corn for a day is not nutritionally sound. But eating corn combined with other foods such as beans, squash, turkey and fish provides the vitamins and minerals we need. This also has spurred my interest in how it is very active tribespeople found enough calories. Hunting, gathering, catching/training horses, building homes, moving, playing stickball, running, canoeing, gardening, etc., etc., all required a tremendous amount of energy. If large sources of protein, like buffalo, elk, turkey, salmon, weren't available, what did they eat? Very active men, especially young men, require many calories. Did they instead turn to lots of berries, corn, chia? Or were they very efficient at using every calorie they ingested? I think that the main goal is to realize that a diet that is comprised of unprocessed and uncontaminated foods, both New and Old World, will provide us with the nutrients we need. I bought a cherimoya, a fruit native to the Andes, at a local market. It is sometimes referred to as a "custard apple" but it's not related. Just eat the insides (not the seeds) with a spoon. This looks like goolash, but is a combination of cooked corn meal, ground turkey, zucchini and yellow peppers. I added salt, pepper and onion powder. 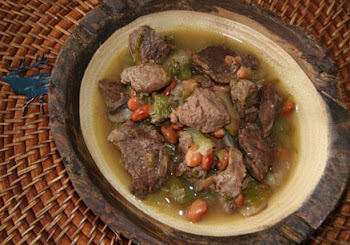 The longer it cooks in the crock pot, the more the flavors mingle the more desirable the texture. I made a plate of sauteed yellow squash, zucchini and sweet red peppers, then added some of the last peppers from my garden as a bit of crunch. That long green one is HOT. Underneath is a corn tortilla I made with Maseca corn masa. I don't like white flour tortillas, but love corn ones. My favorite part of a tamale is the corn. Anyway, Maseca flour is sold in most stores and is a mix of pure corn flour and lime. Mix it with water as per instructions. I don't have a tortilla press, so I flattened the flour balls between wax paper by pressing down with a medium sized pan. I cooked them on a pancake griddle for about a minute on each side. Bananas and plantains are not the same. In this shot, plantains are at the top, bananas at the bottom. Don't eat plantains raw. Yuk. 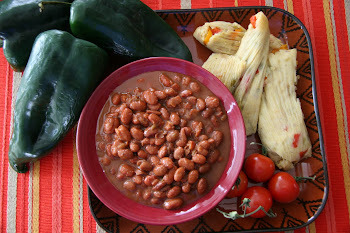 Here is a breakfast idea: plantains and prickley pear cactus fruit. Peel the plantains and cactus fruit, slice into small bites. Add 2 tablespoons vegetable oil to skillet and turn to medium heat. Saute the plantain and cactus fruit until tender. The cactus fruit has large seeds that might break teeth. I put that fruit in a strainer and mashed it down to extract the red juice and pulp. Mix with the plantains. Add a bit of salt and chili powder. I went for a long run this morning in the cold wind and started craving soup about four miles away from home. It's a good idea to eat something before you head out, otherwise food may be all you think about. Here is how I made soup from butternut squash and sweet potatoes. Peel the squash and potatoes, place in a pre-heated skillet (left) with vegetable oil then saute until soft. When done, place in a food processor or blender with water and process until it's as thick or thin as you like. I prefer to add turkey stock, but forgot to take the frozen stock from the freezer yesterday. Add salt and chili powder for more flavor.The potatoes add a nice element of sweetness. I saved some of the vegetables for later. I'll add onion and red chili peppers to the mix. This was lunch. Leftovers of the turkey I cooked last night mixed with cranberries, rice, chia seeds and the last of my garden tomatoes. I took this with my iPhone and it's dark, but that is turkey, tomatoes, and rice with cranberries. After my family strips the bird I'll boil it to make broth. Yesterday I mentioned that insects are nutritious. In case anyone is interested, insects are a major part of many diets around the world. According to this article, "Insects as Human Food," "hundreds of tons of mopanie (a caterpillar) are exported annually from Botswana and South Africa to Zambia and Zimbabwe." That's a lot of caterpillars. 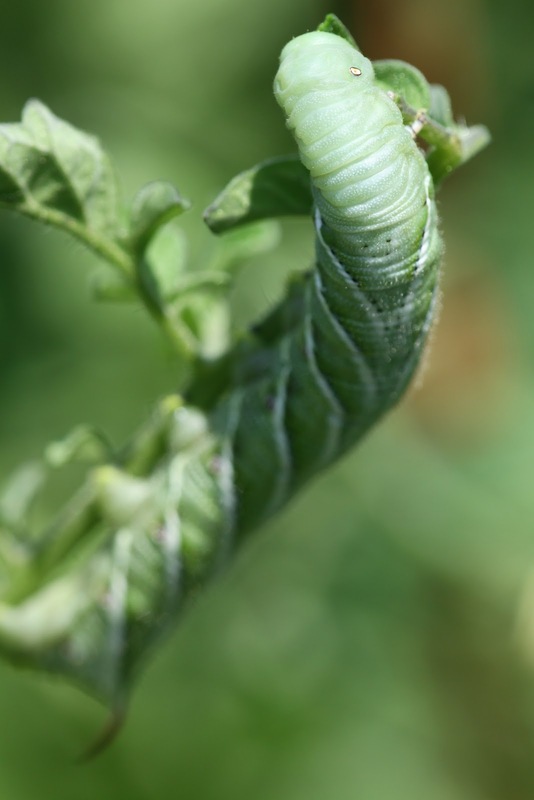 Tomato worm devouring my plants in July. Don't eat it. I wanted to include a caterpillar picture. I'd like to know what everyone is drinking--besides water. I posted on Marty's page that I am a Propel junkie. I carry packets to mix with water in my Camelbak and metal bottles. I have tried using infusions of herb teas for flavor but they aren't all that exciting. I'm going to try blueberry mixed with Stevia sweetener. I drink a lot of water and am never without a [non-plastic] bottle. Re booze: My students like to remind me that Tequila is indigenous to this hemisphere. And indeed it is. So is pulque and mescal. Indigenous peoples south of the border made pulque from the agave, or maguey, plant and were able to refine their production of the drink after being introduced to the distilling process by the Spanish. I have never tasted pulque, but it reportedly tastes like sour milk mixed with gunpowder and Limburger cheese. One student has had it several times while in Mexico and likes it. The word "Tequila" is patented and is brewed in the Mexican town of Tequila.It's made from 12-year-old blue agaves. The worm you may see in some bottles is the maguey worm. Mescal is made from the heart of the agave. Has anyone tasted hot chocolate made from 100% cacao and sweetened with honey? I love fruit, but it doesn't fill me up unless it's an entire watermelon or cantaloupe. Today I mixed it up. What you see above is eclectic: banana, papaya, guava (I found some in a can and drained the juice) and half an avocado. I normally wouldn't eat that much avocado, but since I am drastically reducing my fat intake this week, half a small fruit is probably a good idea. 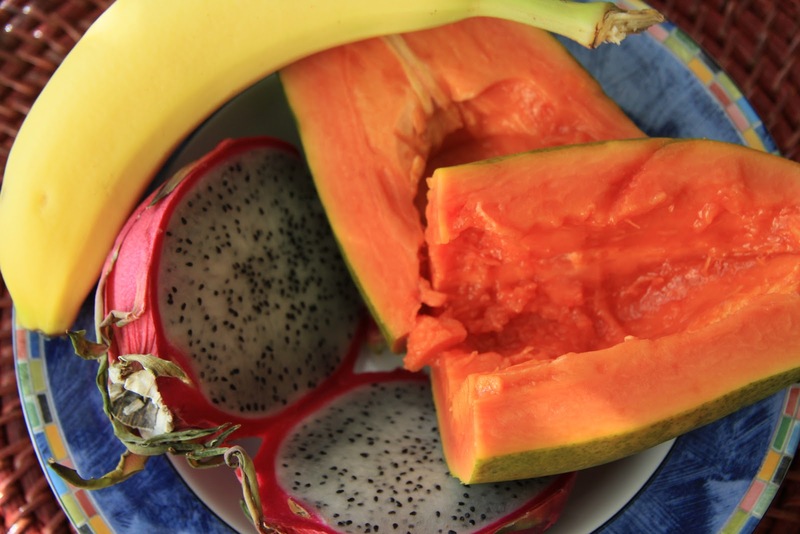 It's filling, full of unsaturated fats and mixes well with the sweeter fruit. These are baggies of frozen turkey that my husband Josh shot last spring. The meat is in the oven right now and I plan to make several dishes later in the day. I still had a sore throat yesterday and didn't eat much. For breakfast I had a banana and peanut butter again (filling). Throughout the day I had blueberry and Echinacea tea. Today for breakfast I had a banana, papaya and small bowl of corn mush topped with agave syrup. Lunch yesterday was a salad of tomatoes, zucchini, onions and a bit of vegetable oil and pepper. Lunch today was a bit of a cheat. I had meetings, then class until 12:15, then a meeting after that. Grad student Ed Smith and I stopped at the union after walking up the hill and got strawberry smoothies. I didn't feel too bad about that since it was made with water. It did have a no-cal sweetener, but the large glass was still only 70 calories and the cold berries felt good on my throat. After the meeting, I was ravenous and the only edibles in my bag were a Luna bar (can't have it) and chocolate covered insects. Now, I don't normally carry these things with me. I had some for my Indigenous Food and Health students to sample a few weeks ago and one box got tucked under my sandisks, Kleenexes, papers and other briefcase junks. Crunchy, but these 4 crickets and wormy guys are not filling. Insects are, however, very nutritious. I did make another nut and seed mixture this morning, this time with pumpkin and sunflower seeds and some peanuts mixed in. I forgot them, however, which is why I ate the insects. Got home a while ago and warmed up some more corn mush and this time put maple syrup on it. This is the shorthand version of Choctaw tamfulla. 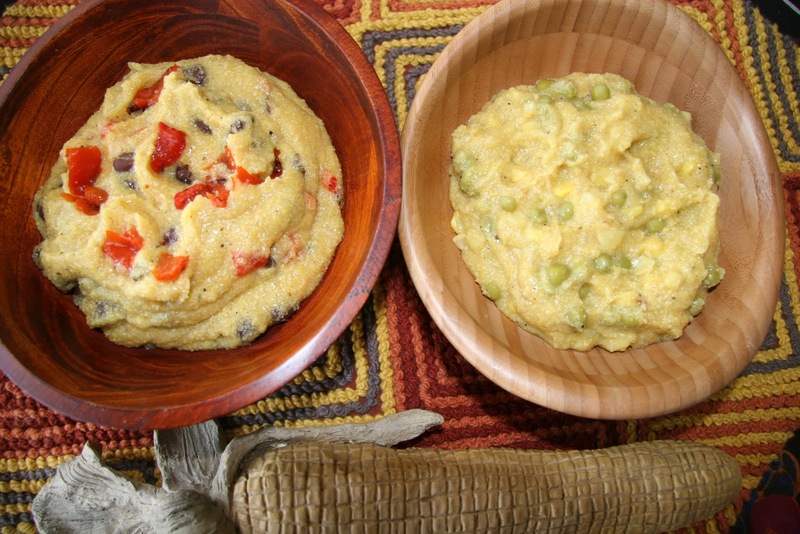 I simply put cornmeal in a small crock pot and cooked with water until very tender. That's it. I love corn in all forms and eat it everyday. Went to feed my catfish. These guys are huge and we need to catch a few before it gets too cold and they settle at the bottom of the pond. Good Morning and Welcome to Day One of the Indigenous Eating Challenge. Anyway, the cross country celebrations included a late night party and bonfire on Saturday, then the boys' team spent the night at our house. I ran ten miles after the guys left and probably went too far on too little sleep. Am a bit pooped and my throat feels it. Breakfast today was two glasses of water. Normally I'd have half-caff coffee and some tea. My throat wanted water. Then I had a banana smeared with "all natural" peanut butter. I don't like the unprocessed kind, however. As you may have noticed, the cost of peanut butter has risen dramatically because of the poor peanut harvest, so we are exploring the other nut butters. This looks like a child's 3-D cell model. Tuesdays and Thursdays are long days for me. I have early office hours, then teach, then meetings. I'll swim at lunch and won't eat a real meal until I get home. This is a mix of pine nuts, dried strawberries, dried coconut, chia seeds and cranberries. I am out of dried bananas. Drat. I take a spoon along since the chia seeds will spill otherwise. I also have to drink a lot of water with this mix. 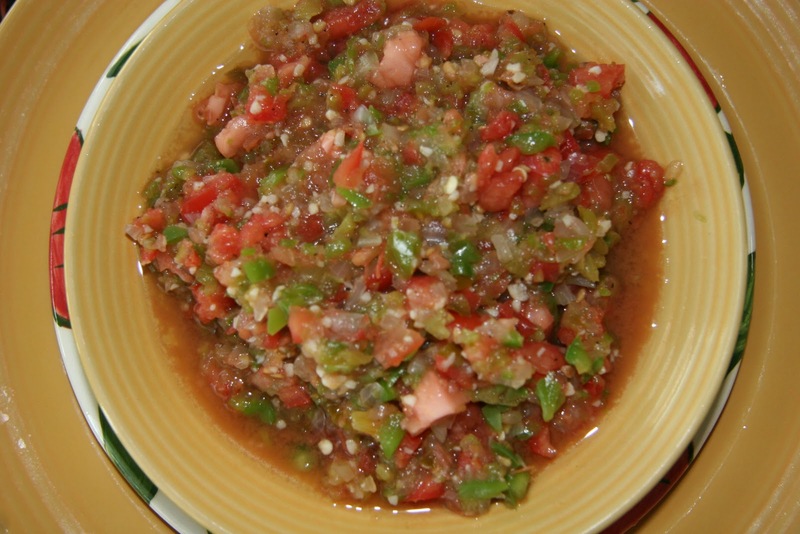 This is a quick salsa mix. A cross country mom made this for the party and gave it to me: corn, chilies, tomatoes, onions, black beans. How convenient for me! I will put this on polenta later today. This looks like the rising oval sun. I made turkey chili/stew in the crock pot yesterday. Ingredients are basic: ground turkey, tomatoes, green chilies, onions, and ground red chilies (a powder I made). I left out garlic. This will probably be late lunch when I get home. 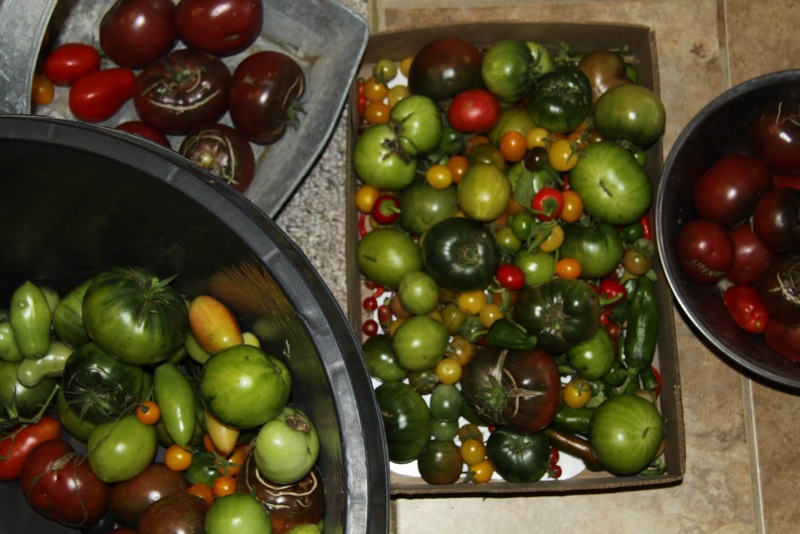 I picked the last of my garden last night--the first freeze arrived around 4 a.m. I found a lot of tomatoes and peppers. The green ones will go in paper bags so they can ripen. 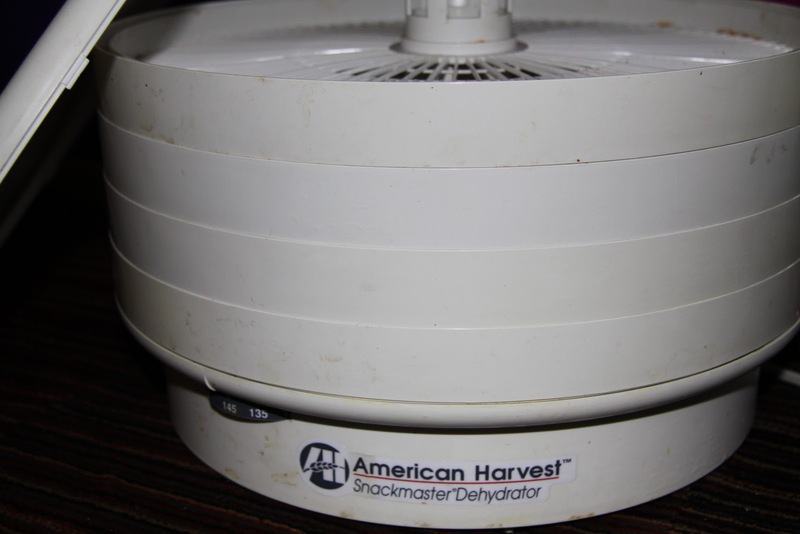 My American Harvester dryer is old, but still works. 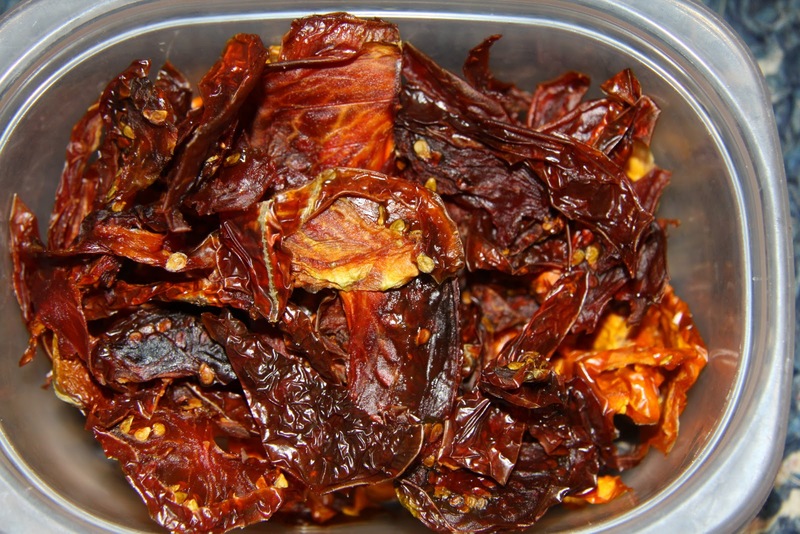 It has dried venison, apples, tomatoes, peppers, mangoes and even liver for my sled dogs when we lived in Arizona. I don't recommend drying liver since it stinks beyond description. Here is a container of tomatoes. The flavor is sweet and intense. If you live in a hot and dry climate, you can dry them in a screened-in porch. We'll use these as snacks and on sandwiches. 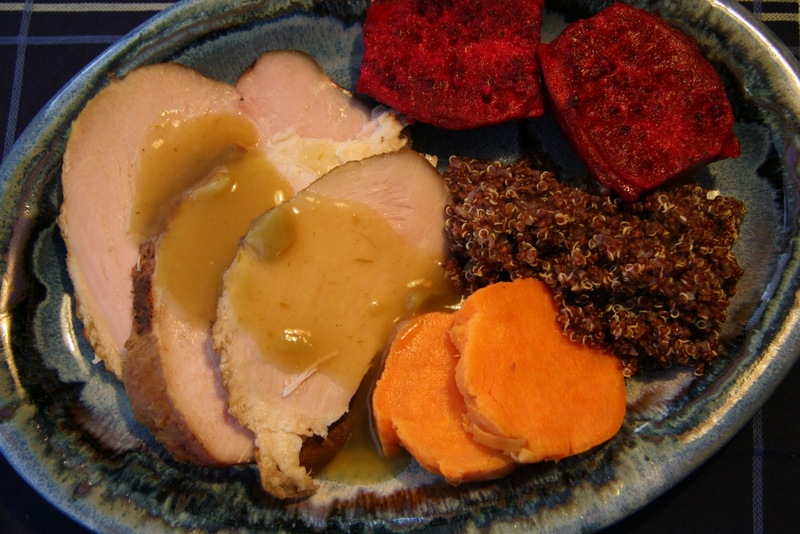 Dinner I made last week of turkey breast, sweet potatoes, quinoa with peppers and tomatoes, prickly pear cactus fruit. ﻿ ﻿﻿When you plan your meals, you may find this site useful. "My Calorie Counter" allows you to enter everything you ingest and the site computes the nutritional content of your food. Students in my History of Indigenous Food and Health course are required to keep a detailed food log. Many use this site to learn just how much fat, cholesterol and sugar they are eating, as well as vitamins and minerals. This is quite an eye-opening exercise for those who have never chronicled their diets. 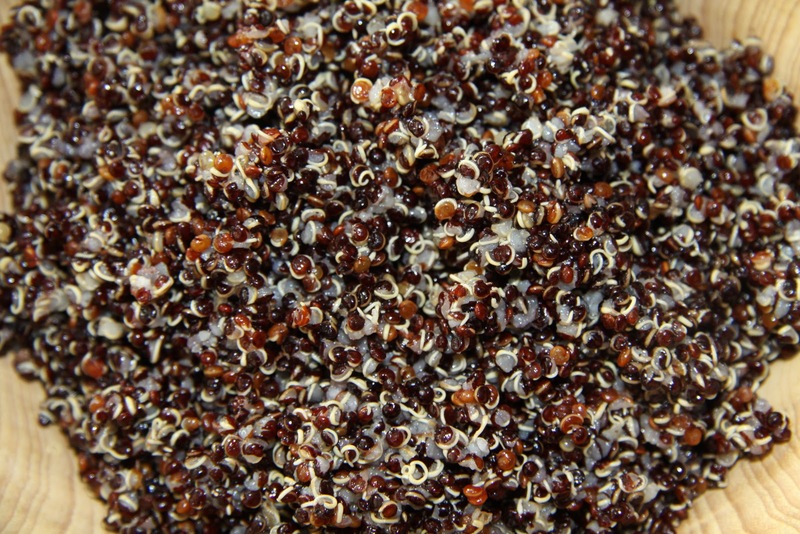 Quinoa, a chenopod, is a staple food of the Incans. It is gluten-free and has a protein content similar to milk. 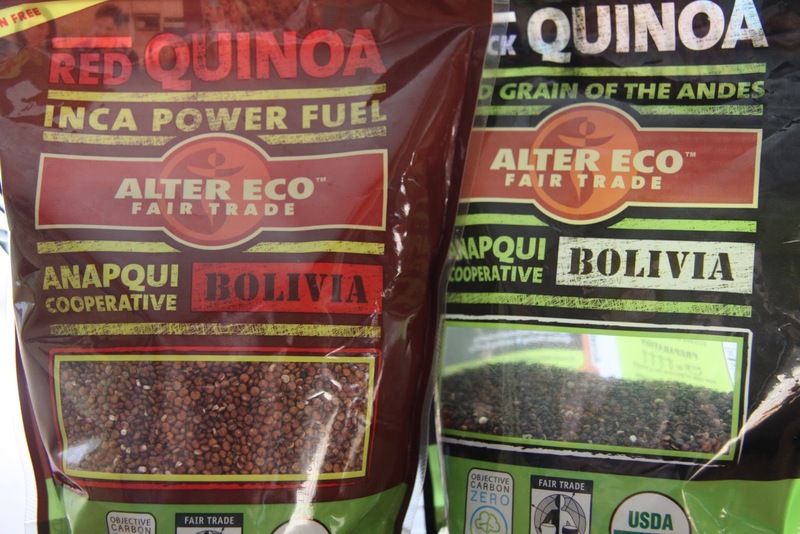 It also contains calcium, iron, phosphorus, vitamins B and E. Quinoa is black, orange, purple, red, or white. When cooked it looks like little squiggles, has a soft texture and tastes "earthy." It's easy to prepare. I buy the Alter Eco brand (below), both red and black. One cup of dry quinoa prepared with 4 cups of liquid serves 4. You can eat quinoa plain (above). I made the black version with vegetable stock and black pepper. You also can use turkey stock and mix in sauteed squash, onions and peppers or, mix with scrambled turkey, goose or duck eggs. I have used quinoa in turkey and venison meatloaf and burgers.